Ten current or former Minnesota high schoolers were taken in the 2018 NHL Draft. Edina's Demetrios Koumontzis was taken by the Calgary Flames in the fourth round of this year's NHL Draft. The Arizona State commit is coming off a strong senior season with the Hornets. Photo by Mark Hvidtsen, SportsEngine. K'Andre Miller: After three Minnesotans were taken in the first round of the 2017 NHL Draft, Miller was the only North Star State native taken in this year's first round. The University of Wisconsin commit played his two most recent seasons with the U.S. National Team Development Program, where he logged 42 points in 105 games. Scott Perunovich: Perunovich was selected in the second round by the St. Louis Blues after winning a national championship with Minnesota-Duluth in 2018. He led the Bulldogs with 36 points last season and also played with Team USA at the 2018 World Junior Championship and took home a bronze medal. Blake McLaughlin: McLaughlin was one of two members of the 2017 state champion Grand Rapids team to be selected in this year's draft. McLaughlin played in the United States Hockey League last season and will begin his career with the University of Minnesota this fall. 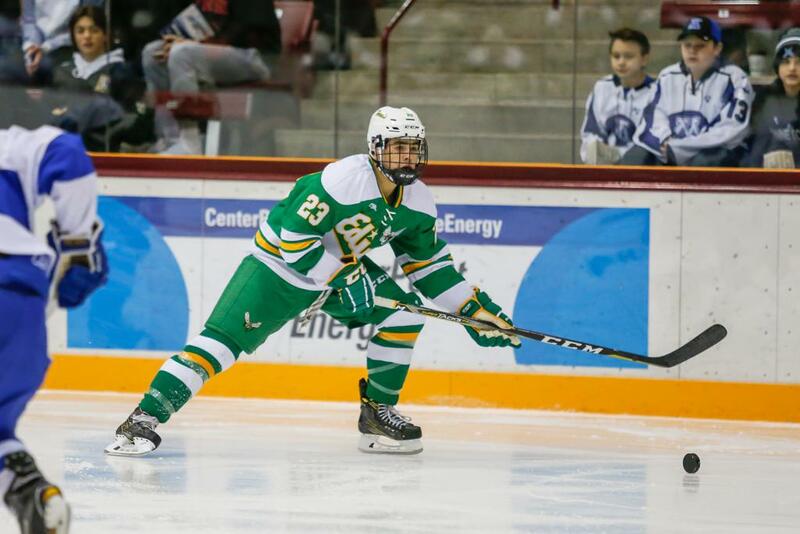 Demetrios Koumontzis: The Edina graduate is off to Arizona State to play college hockey in the fall but was also drafted by the Calgary Flames in the fourth round. Koumontzis led the Hornets to the Class 2A state tournament in 2018 while tallying 22 goals and 27 assists. Jack Perbix: The Notre Dame commit was selected by Anaheim after scoring 21 goals and 47 assists in his junior season at Elk River. Perbix will have one more year of high school eligibility and could end up playing with the Green Bay Gamblers of the USHL. Gavin Hain: Hain joined his former high school teammate (McLaughlin) in being a member of this year's draft class when he was selected by the Philadelphia Flyers. The North Dakota commit spent the 2017-18 season with the U.S. National Team Development Program and scored 11 goals and 20 assists with Team USA. Cole Koepke: The Hermantown native was selected by the Tampa Bay Lightning after two strong seasons with the Sioux City Musketeers of the USHL. Koepke won a state championship with the Hawks in 2016 and is committed to the University of Minnesota-Duluth, where he will be among seven Bulldogs selected in the NHL draft. Jared Moe: The University of Minnesota commit is now a prospect for the Winnipeg Jets after being selected in the sixth round of the draft. Moe played his sophomore season with Holy Family Catholic before playing in the USHL last season. With one more year of high school eligibility remaining, Moe is expected to stay in the USHL. Luke Loheit: Loheit's year continues to get better and better. After winning the Class 2A state title in his senior year at Minnetonka, Loheit was drafted in the seventh round by the Ottawa Senators. Loheit wrapped up his high school career with 15 goals and 20 assists. He's off to the University of Minnesota-Duluth. Sam Hentges: The St. Cloud State commit is the only Minnesotan drafted by the hometown club. Hentges scored 23 goals last season in the USHL after playing two years with the Totino-Grace varsity team.